[Podcast Tracklisting] 01. Might Dub Katz - Just Another Groove (Doorly Remix) 02. Catz 'n Dogz - It's Happening (Original Mix) 03. Kerri Chandler, Jerome Sydenham - Atmospheric Beats (Original Extended Version) 04. Daruis Syrossian, Doorly - Gravity Check(Original Mix) 05. PAWSA - Bruzer (Original Mix) 06. John Raffaele - Seen You Before [Say Less Records] 07. P.S. 118 - Fragments (Original Mix) [Forthcoming Say Les Records] 08. Azari & III - Hungry For The Power (Jamie Jones Ridge Street Remix) 09. Nah Mean? - Oh (Original Mix) [Say Less Records] 10. Andrea Oliva, Jimi Jules - Cloud 9 (Original Mix) 11. V.ict - Hugenomics (Ryan Michael Robbins Remix) 12. Nah Mean? - Twisting My Mind (Original Mix) [Say Less Records] 13. wAFF - Kidney Punch (Original Mix) 14. Oliver Huntemann, Dubfire, Xenia Beliayeva - Agua (Original Mix) 15. Adam Westing - Resonate (Original Mix) [Say Less Records] Nah Mean? is a Philadelphia based music producer/DJ/dance music enthusiast focusing primarily on house, techno, and bass music production. The energy he carries for music can be observed through his mixes, tracks, and his record label – Say Less Records. This label boss started Say Less as a passion project, on his own, and is quickly to transforming it into one of the most premiere house and techno labels in the Philadelphia area. Nah Mean? is no stranger to the Philadelphia nightlife either – holding residencies at Club Webb Live from 2015-2016 and playing at venues such as Coda, Underground Arts, Silk City, District N9ne, and Kung Fu Necktie. You may have seen him directly supporting artists such as Mark Farina, Goldfish, Lindsay Lowend, Paper Diamond, or making festival appearances at Mysteryland, The Funky Dad’s Gala in the Grove, and Luna Light Music & Arts Festival. His deep/tech house/techno sets offer a unique track selection, clever effect use, and great vibes that draw and connect with an international crowd of dance music lovers. 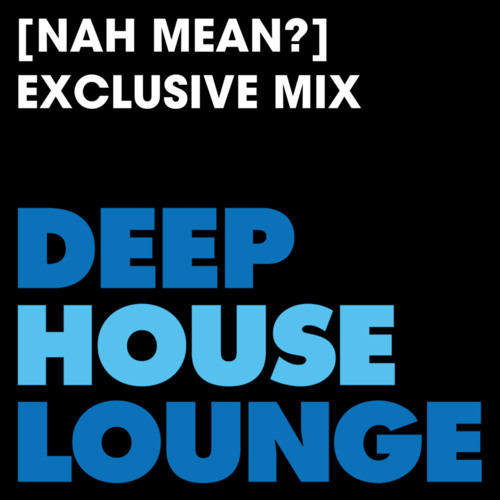 This deephouselounge mix features various Say Less tracks, both released and unreleased, including tracks from John Raffaele, P.S. 118, and Adam Westing. Spend an hour with Nah Mean? as he takes you on a journey through old to new school dance tracks. Out now on @say-less-records !